Proud and brave, who wouldn’t want that happy little lion by their side? As a fantastic companion bundled in a small package, your Shih Tzu will stick with you through thick and thin, loving you always. They will certainly give all they can to us, so why not provide your little fur-kid the best in return? Undoubtedly among the world’s oldest dog breeds, Shih Tzu type dogs can be seen in chinese paintings dating back to the sixth century. Documents and records from the time claimed these dogs were gifts from the Byzantine empire, meaning they could be far older than we realize. In fact, it was a popular practice among asian nobility to gift small ‘lap dogs’, some even given their own guards and ranked equal to the emperor’s wives! About 95% of pet owners would be absolutely astounded, disgusted, if they actually knew what went into their pet’s food. Very rarely is store bought pet food considered fit for human consumption. That being said, many countries don’t meet the FDA standards the United States implements, low as they may be for our animals. Dangerous concentrations of metals or other chemicals can sometimes be found in Chinese tested products, important since the Shih Tzu is a Chinese originating breed. Mad Cow Disease, a 100% lethal disease that will eventually kill everything infected, is believed to have originated from the United Kingdom from tainted meat and bone meal (described below). It’s important to know where your food came from! By-products: These are ‘clean’, non-rendered ‘parts’, other than meat, derived from slaughterhouse animals. By-products of any kind are considered unfavorable, and can include lungs, spleen, kidneys, brain, blood, bone, fatty tissue, stomachs and intestines. Meal: A ‘meal’ is the end product after various ingredients have been added to large industrial vats, ground together and cooked at high temperatures, dehydrated (water removed), and all the fat has been removed. Depending on the source of animal meat, meals can contain much higher concentrations of protein. Meat and Bone Meal: This is the absolute lowest quality, cheapest type of meat meal, and considered a poor ingredient. The fact that the source of meat isn’t indicated is highly suspicious, and ground bones are considered difficult for our pets to digest. Corn, Wheat, & other Grains: Dogs are meant to consume animal meat and animal protein, not plant products, and especially not plant products offering almost no nutrition at all. Ingredients like the ones in bold are often used by manufacturers in order to cheaply create a large amount of end product. These are also known as ‘filler ingredients’. After all is said and done, how do you really decide on a great food? What is the difference, anyway? How in the world are you going to distinguish between all of the many colorful, shiny packages of various foods lining the dog food section at your local grocery store? Well, to be simple – there are a few things marketers use to subconsciously attract you to their seemingly superior products, which of course don’t matter in the least when it comes to nutrition but unfortunately are effective at fooling most. Then there are the finer details that truly do matter, which are most often ignored. Despite their miniature size and stature, several small breeds may often actually require more calories per pound than larger breeds. Producers will use this strategy to ‘draw you in’ visually. After all, how could that fantastically attractive package not be full of the best? Be aware; this makes no difference at all. Grocery stores will often stock their cheaper products more likely to sell closer to the front- so buyers can find them easily. These dog foods are cheap for a reason; you get what you pay for. An adult Shih Tzu normally weighs between 8.8-16 pounds, so could easily fall under the ‘Small Breed’ category. Small breed dog food was designed for small breed dogs, usually easier to chew and swallow. Though there may be laws prohibiting direct lies, there is definitely a huge grey area when it comes to ‘truth in advertising’. The real answer behind the quality of your dog food lies here, on this label. Though manufacturers can claim almost anything on the front, they are mandated by the FDA (may not apply in non-American countries) tolist the exact ingredients here. Of course, this will require you to have some knowledge of those ingredients! Caring for a dog, or any pet, involves commitment and focus. Responsible pet owners won’t mind devoting the mere few minutes a day it takes to browse an article, learning bit by bit. Only through education can you truly know what is really best for your Shih Tzu, and not simply what people want you to believe! *Before we go on, you might wonder why some specific foods specifically labeled ‘for Shih Tzu’ aren’t listed here. Remember, just because it might claim to be the best food for a certain breed doesn’t mean it actually is. 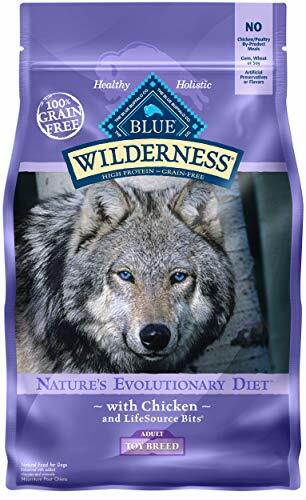 Who hasn’t heard of Blue Buffalo, one of the most popular names in dog food? Made with chicken meal, chicken and fish, Blue’s High Protein recipe not only supplies your pup with the ideal nutrients, but contains a wholesome blend of fruits and veggies, high quality antioxidants and enhanced vitamins and minerals! Excessive use of plant based ingredients, peas, potatoes, etc. Specifically developed for small breeds, Nature’s Variety actually developed a freeze dried recipe to ensure your dog’s food will not only stand the test of time, but perfectly preserve vital nutrients in the process! Made with premium turkey and chicken, you can tell this is a great choice right away! 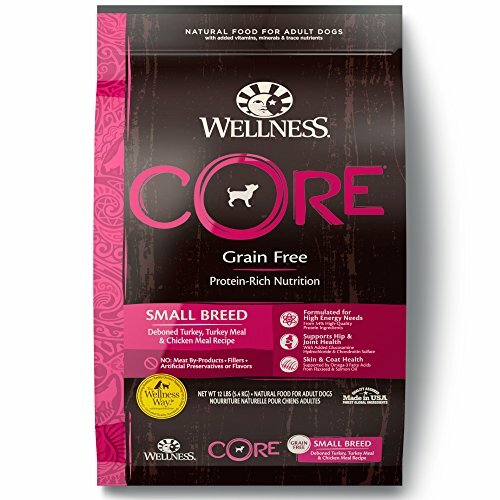 Already a leading name in dog food, Wellness CORE offers the perfect balance of calories and various nutrients to support healthy small breed growth and lifestyle. Not only is this protein rich, we’ve got exceptionally high levels of the right kinds of proteins- chicken and turkey meals with up to 300% more than regular chicken or turkey! Not only do we have two premium sources of the animal based protein your dog needs, ‘meals’ are concentrated and offer up to 300% more protein than regular meat! 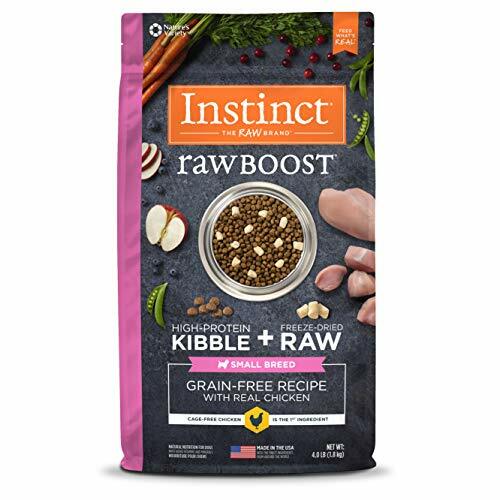 Limited ingredient dog foods are often prescribed by veterinarians and used by pet owners to help treat pets with food allergies, helping to eliminate the allergen by only offering a few specific ingredients, as opposed to the many most dog foods do. Again, we’ve got two fantastic, high protein ingredients your pet will love! Just like the food offered above, ‘deboned’ ingredients have their bone material removed before rendering, in order to enhance digestion. 1. What should I feed a Shih Tzu puppy? Puppies older than 10 weeks, or between 10 weeks and 1-2 years, should ideally be fed puppy food designed for small breeds. As they grow to become adolescents, you can begin to slowly transition to adult small breed dog food. Extremely young puppies should be nursing from their mothers; they’ll find all the nutrition they need from their mother’s milk and don’t need any other food/water. Because mother’s milk carries nutrients very hard to find anywhere else in exact concentrations, it’s extremely important for their development they get this. If your puppy isn’t able to nurse from mother because it was seperated to early, mother is no longer available, or any other reason, you should consider speaking to your veterinarian and seeking a man-made replacement. Around 4 weeks, begin the transition to wet puppy food (store bought). Your puppy will be able to gain extra hydration this way, and the food is easier to eat. Make sure the transition is slow; don’t immediately switch from nursing! The slow transition is to avoid digestive complications. 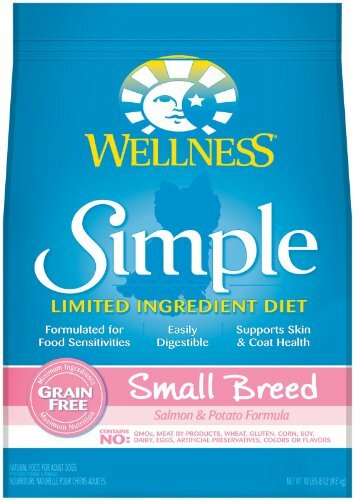 Around 8 weeks, you can now begin the slow transition to dry puppy food for your Shih Tzu. If you aren’t sure what to provide, there are some fantastic options above! 2. What do Shih Tzu Dogs eat? This is a somewhat loaded question, so I’ll give you the simple answer first, and the technical answer second! Since they are a small breed, Shih Tzu dogs should be fed small breed dog food. Small breed dog food both comes in the shape of smaller kibble for easier consumption, and is nutritionally designed to suit a small breed dog. Again, dogs are classified as carnivorous, their bodies biologically designed to live best on animal based proteins. You want to make sure the dog food you’re feeding your pup consists of animal based ingredients- at least the top few ingredients listed on the nutritional label. Many manufacturers like to produce plant based dog foods, using inexpensive vegetable ‘fillers’ in order to save money, so be careful! 3. Why or when should I feed my Shih Tzu wet dog food, as opposed to dry kibble? Sure, wet dog food might seem a bit more on the expensive side. Those little containers also might not last nearly as long. Still, it can serve very important nutritional functions in certain situations. Wet dog food contains a much higher moisture content than dry, of course helping provide extra hydration your pup needs. Your veterinarian might prescribe this in certain situations where extra water is important, or if your pet isn’t drinking as much as he would. Many owners also provide wet dog food during the hot summer months. During the early stage of a puppy’s growth, when transitioning from mother’s milk, it’s important to use wet food as a mediary and not simply jump straight to dry kibble. This stage revolves around the first 4-8 weeks of life. Often a symptom of advanced aging (though sometimes not), a dog will begin to experience dental pain along with aging oral health. He might not want to eat often anymore because chewing those tough dry pieces of kibble causes pain. If this is the case, wet dog food is your ideal alternative. If you’re looking to provide your precious little one with the absolute best nutrition available, there is no need to look further. We know how much your loved one means to you, and wish only the best for you both!